Wabash College President Patrick E. White has announced the appointment of Will Oprisko as the College’s new Associate Dean of Students. 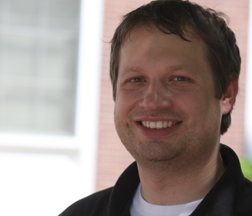 Oprisko will begin his responsibilities at Wabash on July 6, 2009. "Will Oprisko brings to the position important on-the-ground experience in leading independent and Greek life, and a commitment to engaging students in the process of making the most of living units as learning environments,” said President White. “We look forward to his leadership in shaping our discourse on responsibility, wellness, the Gentleman's Rule, and many other important aspects of campus life." Oprisko, a graduate of Taylor University, comes to Wabash after spending the last four years as Area Coordinator at John Carroll University in Ohio. In that post, Oprisko oversaw two 250-student residence halls, led a staff of 14 residence assistants and two senior resident assistants, and directed the programming for both honors floors and Greek floors. He also spearheaded the recruitment, training, and evaluation of resident assistants, and served as a first responder for emergency situations. "I am thrilled Will has accepted our invitation to become our new Associate Dean of Students,” said Mike Raters ’85, Dean of Students at Wabash. “His student life experiences, engaging personality, and creative approaches to the overall development of our men allowed him to emerge as the top choice from an outstanding pool of candidates." Oprisko majored pastoral studies and minored in psychology at Taylor University, and earned a master of science degree in student affairs administration from Indiana University. He served as a graduate supervisor while at Indiana University, and in that position assisted with the day-to-day operations of a residential community of 1,100 students. At Wabash, Oprisko will be involved in a wide range of residence life activities, including the direction of the College’s Housing Education and Leadership Program (HELP). “The most rewarding aspect of my job has always been working with students to assist them in their personal and academic development,” said Oprisko. “I believe Wabash College will provide me with ample opportunities to serve as a resource and help the students navigate the complex choices before them. "Dean Oprisko will be able to immediately contribute to the continuous development of our Orientation and HELP programs, student leadership initiatives, and crisis management teams,” said Raters. Oprisko is a member of the Association of College and University Housing Officers International and the Northeast Ohio Housing Officers association.